An interesting pickup I couldn’t pass up just on looks alone, this Vancouver Canadians cap is done in a style similar to the Montreal Expos’ cap. While the Canadians never wore this style of cap (theirs featured a white front with red side and rear panels, blue brim) this look is distinctly north of the border thanks to the aforementioned Expos; the Canadians have also paid tribute to the ‘spos by sporting jerseys inspired by the round wordmark of the team for Hall of Famer Tim Raines for a game. The team currently functions as the short season A affiliate of the Toronto Blue Jays and is the only minor league team in Canada. The Canadians wordmark also bares another similarity to a Canadian staple: Molson Canadian beer. The team may have been owned by Molson hence the matching wordmark motifs. 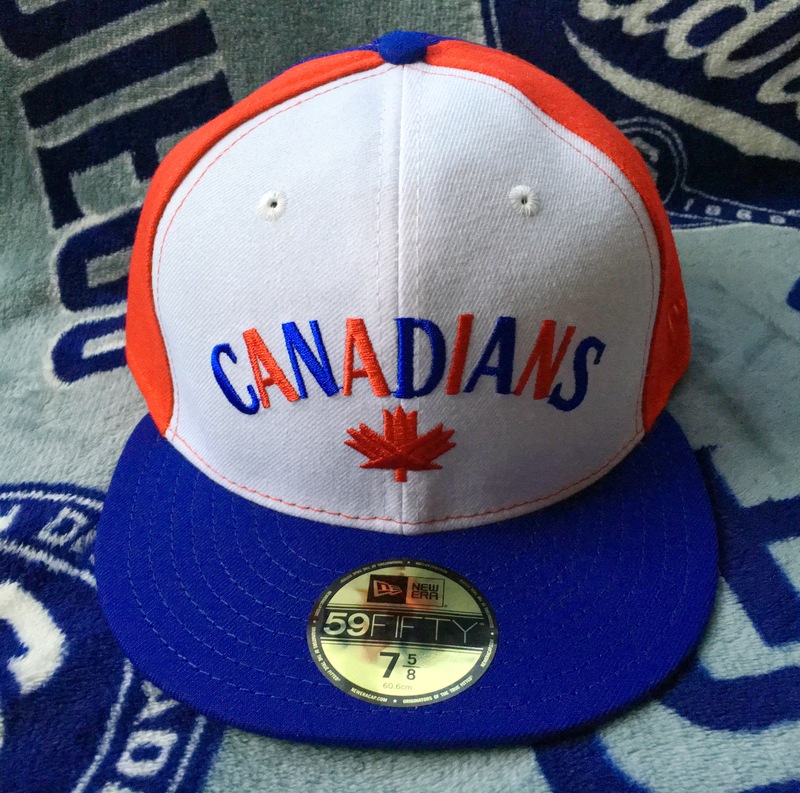 The Canadians team depicted on this cap no longer exists; this team would move to Sacramento and become the River Cats. The current Vancouver Canadians franchise started in 2000. Former Padre Craig Lefferts was a pitching coach for the current Canadians franchise in the mid-2000s. The Vancouver Canadians used this particular wordmark from circa 1984-1999, where the Triple A World Series-winning club was sold and shipped to California prior to the 2000 season. Here’s a better look at the eye-catching alternating colors. The rear of the cap is devoid of any logos. The underbrim is retro green; the sweatband is thankfully black. This cap sold as quickly as it was launched from Hat Club. While some sizes are still available, your next best bet is to hope for a restock.